High Litterature | high road to..
What´s All This About Then ? A few times it comes down to a few people . Or just one. He then named the final deciding factor in reaching the top : a better understanding of how the human body works , delivered by the physiologist Griffith Pugh , and taking the consequences from that . Pugh was what we’d today would call a boots and GoreTex doc, starting as a Army doc , training British soldiers in mountain warfare during WW2. Coming in to contact with the Everest effort he recognised that that climbers failed ( and ultimately often died ) from the same factors seen in the battlefield . They failed from being exhausted from dealing with cold conditions , and being starved on water , food and oxygen. Pugh then set out systematically to change all of that. He started with redesigning clothes : exchanging buttons for zippers. Introducing taffeta lining so that the anoraks would go down , and stay down , instead of hitching up from the backpack movement. New fabrics . Constructing new double walled tents , and having them tested first in wind tunnel labs , and then on the mountain. New sleeping bags that allowed turning in your sleep. The first inflatable ground pads for climbers. Having dealt with cold , Pugh went on to food , and introduced the ration model we today still recognise not only from climbing expeditions but also from the International Space Station. One part very well calculated rations that will cover all the essential needs of the body – and one part personal favorites chosen by each member , the stuff that makes you want to go on. Pughs first goal however was to end oxygen starvation , and making the climbers of the 50’s accept the use of oxygen was a long and bitter fight . It had already cost the first expedition leader his job , which didn’t mean that his successor Hunt was an enthusiast. Climbers had two reasons for their resistance . One was tradition , seeing the use of oxygen as cheating. The other reason came from bad experience. The first oxygen rigs were basically bomb plane equipment ripped out from the cockpit , giving the flow rates that had proven to work well for pilots sitting in a chair. Climbers rightfully bitterly complained over the result : heavy equipment meaning more work with little relief from the extra oxygen. Lighter kits and more than double flow rates made a dramatic change , both in how climbers performed and in accepting the idea. Having calculated and changing the rations of food and oxygen Pugh went on to the fluid rations. The British rations were extremely low , around a half liter per day. Pugh came up with what was called “copious ” drinking at that time. The problem came from the storm kitchens used at the time : Pugh introduced new kitchens and carrying enough fuel to smelt snow and ice efficiently. This last part came to be the least understod of the changes Pugh introduced. It’s not even clear that Pugh made any connection between dehydration and altitude sickness – a common idea that many have tried to prove , with miserable results. The fluid rations that took Hillary and Tenzing to the top …this is the part where many will start to guess wildly , starting from 5-6 liters per day . Actually it was 3-4 liters , and this is still the the recommendation from for example the Himalyan Rescue Association , after three decades of experience of running the Pheriche first aid clinic enroute to Everest. It also comes with a warning of the risks of binging on water. The Everest success led to a tradition of stressing fluid intake , taking it to another extreme. Today we know both that you can’t perform well on low, low water rations – and that the other extreme is at least as harmful : there are well documented deaths after extreme water intake , at all altitudes. This is slowly getting acknowledged despite the high water intake theory has been a pet project for a long time : last year British National Health Service finally gave up their recommendation that all visitors at any altitude , any degree of activity should drink almost the double ration of Hillary and Tenzing ( 4-6 liters ) , and halfheartedly replaced it with ” plenty of fluids”. On top of this is there is a lot of medical history , with still highly relevant results. 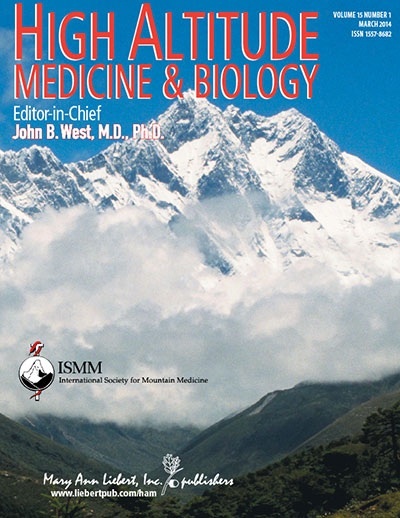 There is a whole issue dedicated to the 50 year anniversary of the Silver Hut expedition , still a benchmark in the effects of extreme acclimatization : five months spent at 5800 meters , followed by bringing down more physiological data from up to 7400 meters. Those who still believe that it’s essential to push large volumes of fluids will struggle with the fact that that Milledge and the other members managed well on around three liters of fluids per day , including climbing up to 7000+ meters. 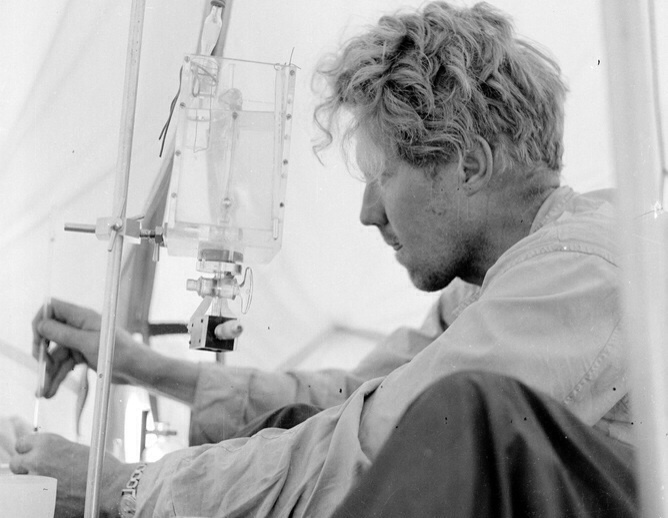 One of the results of going thru this issue that I’ve just dived in to the man and explanation of why the Hillary/Tenzing ascent succeeded , after seven British fails in a row : Griffith Pugh , the picture perfect mad scientist and genius that that pushed a kicking and screaming climbing fraternity in to a physiological approach to climbing : using oxygen , planning nutrition, designing tents and more.